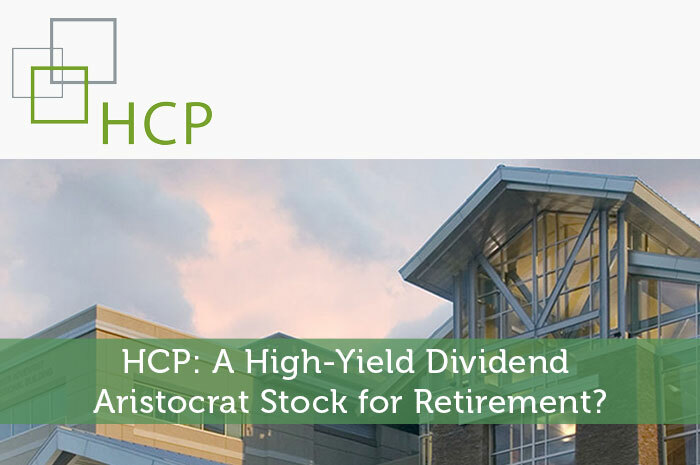 HCP Inc. (HCP) offers a high-yield dividend near 7% and has historically been a reliable dividend payer as evidenced by its inclusion in the S&P Dividend Aristocrats Index. In fact, according to the company’s website, HCP has increased its dividend for 31 consecutive years and is the only real estate investment trust (REIT) member of the dividend aristocrats list. Not surprisingly, the stock has been a favorite holding for retired investors seeking safe income. However, with a high-yield dividend and disappointing stock performance over the past year, many investors are wondering if the dividend remains safe. HCP operates more than 1,200 healthcare properties serving tenants primarily in the senior living, skilled nursing, medical office, and life science industries. The company has spent billions of dollars on acquisitions to grow its real estate portfolio since going public in 1985, but it still depends heavily on two tenants for a substantial amount of its revenue. HCR ManorCare and Brookdale accounted for 23% and 10%, respectively, of HCP’s total sales last year. HCP’s dividend safety has recently come into question because its two largest customers are struggling to meet their rent obligations in light of changing healthcare regulations and trends. Brookdale provides senior living care across the U.S. and is currently under pressure due to lower occupancy levels. HCR ManorCare relies heavily on Medicare and Medicaid reimbursements and faces difficult trends in skilled nursing facilities. Overall, HCP estimates that approximately 25% of its annualized rental payments from tenants depend on Medicare and Medicaid reimbursements. Unfortunately, the government’s reimbursement rates can unexpectedly fluctuate and make life more difficult for some of HCP’s customers. Due to the unfavorable trends challenging HCR ManorCare’s business, the company’s ability to cover its fixed costs is deteriorating. According to HCP, HCR ManorCare’s fixed charge coverage last year was 1.07x but fell to 0.97x for the last six months of 2015. A coverage ratio that dips below 1.0x indicates that a company’s cash flow is unable to meet its rent and interest expenses. In these cases, the business faces pressure to sell non-core assets or negotiate lower rent payments. HCP faces risk because it could be forced to reduce HCR ManorCare’s rent. Management currently expects HCR ManorCare’s fixed charge coverage ratio to remain above 1.0x in 2016, but there certainly appears to be little margin for error in the event that industry conditions take another turn lower. While a rent cut might not sound like a big risk to HCP’s dividend, it’s important to remember that REITs are required to pay out 90% of their taxable income as dividends to keep their REIT status. As a result, they generally maintain much higher dividend payout ratios than other types of businesses but usually offer a relatively high yield. When evaluating HCP’s dividend payout ratio, we need to make some adjustments to account for the company’s substantial depreciation charges, which reduce reported earnings despite the fact that real estate values typically rise over time. REIT companies report non-GAAP measures that can help us get a more representative look at HCP’s payout ratio. Rather than use GAAP earnings, HCP reports one measure called funds available for distribution (FAD). This metric is similar to free cash flow for a REIT. HCP expects to generate FAD ranging from $2.62 to $2.68 per share in 2016, which results in a forward-looking payout ratio of approximately 90%. If management’s forecast is accurate, HCP’s 2016 FAD payout ratio would be its highest in more than 10 years. Given the risks involved with HCP’s two biggest clients, it’s no surprise that management is taking actions to strengthen the company’s financial health. HCP is currently in the process of divesting about $350 million worth of non-core assets from HCR ManorCare to reduce its exposure to this customer and improve its credit lease. Overall, we believe HCP’s dividend payment will more likely than not remain safe. However, if Brookdale or HCR ManorCare see their business trends deteriorate faster than expected this year, HCP could feel pressure to moderately reduce its dividend. Regardless, we do not expect any potential reduction to the dividend would be significant. Investing in the healthcare sector requires a good deal of caution due to the high level of government assistance and changing regulations. Picking high-yield dividend stocks in the space requires even more scrutiny. We have a hard time getting comfortable with HCP’s customer concentration risk and its indirect exposure to shifting reimbursement rates. We believe HCP’s stock has been weak because investors are trying to reassess the company’s long-term growth rate in light of the challenging trends observed in the post-acute/skilled nursing industry. While HCP’s dividend still seems more likely than not to remain safe, there are many other fish in the sea with more appealing risk profiles. We prefer to invest elsewhere for our Top 20 Dividend Stocks portfolio given our objectives of capital preservation and safe income growth. HCP: A High-Yield Dividend Aristocrat Stock for Retirement?